Krug presents in Pan Am a clean, modern design for management, conference and task seating applications. Its attractive lines and curves serve an important purpose: comfort. The seat has a pronounced curvature to fit and position the user comfortably, and dual-density foam maintains comfort-enhancing support over longer periods of sitting. It features a waterfall front to offer sustained support to the upper legs. 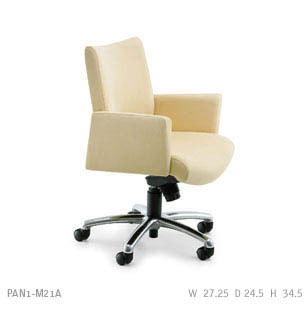 And Pan Am's back has compound curves and emphatic lumbar support that make it a pleasurable and healthy seating solution.